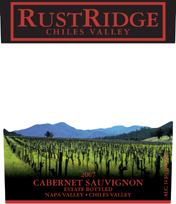 Our 2007 RustRidge Estate Cabernet Sauvignon is the wine that other Napa Cabs dream of being when they grow up. Deep scarlet in the glass, it has luxuriously dark aromas of belgian chocolate, mountain black cherry, and wild blackberry, with hints of dried sage, and black olive. Take a sip and these flavors leap out of the glass, wrapped in gripping but ripe tannins, followed by a long and complex finish that lingers pleasantly on the palate. If you like your Cabernet to be as big and bold as your grilled Porterhouse, Rack of Lamb, or Short Ribs, this is a wine for you to drink now. If you believe that patience is a virtue when it comes to wine, your faith will be generously rewarded as this delicious wine ages gracefully for then next 5 - 10 years.